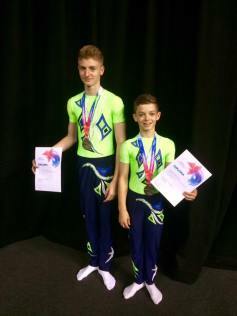 At Harefield Gymnastics our key objective is to teach and develop our gymnasts, at every level, in a safe, nurturing, disciplined and encouraging environment. Our aim is to maintain the highest standards of training possible within the club, so that all gymnasts can reach their full potential. Harefield Gymnastics was founded by Natasha Maxwell and Ron Powell in 2006. Today Natasha continues to run the club as Director of Coaching, together with Amanda Clarke, Commercial Director. Natasha has a wealth of experience coaching elite gymnasts at World, European, National, Regional and club level. Natasha is a qualified high performance and International coach, who has been coaching for over 25 years. She was also national coach for team GB for acrobatic World and European games. During her coaching career, Natasha has produced champions and medalists at both national and international competitions. Her dedication to the sport is second to none. Natasha believes gymnastics should be available to all children and thrives on encouraging gymnasts of all ages and ability to reach their full potential. Natasha is also a qualified teacher currently teaching year 6 students. Amanda Clarke is the Commercial Director who brings a wealth of business experience to Harefield Gymnastics. A qualified HR professional with a degree in Human Resource Management, she has spent many years in senior management positions. Amanda has day to day responsibility for business management and development at the club. Amanda’s passion for the sport of gymnastics, together with her sound management experience and the exceptional coaching attributes and experience provided by Natasha, ensures the club continues to grow and develop into a world class training facility for all levels of general and acrobatic gymnastics. The club has achieved great success since it began more than 12 years ago, producing regional, national and international British, European and World Champions. There is a strong sense of community among our coaching team and gymnasts providing unity, trust, friendship and support. These core values underpin the foundation of Harefield Gymnastics and sit at the heart of the club. Harefield Gymnastics focuses on one of the four main disciplines of gymnastics – ‘acrobatic gymnastics’. We run a range of recreational, squad and elite classes for all age groups. The club also participates in gymnastics development badges, club competitions, displays, club shows, local, regional, national and international competitions. Our gymnastics classes run at our two training sites; Harefield Academy (secondary School), Harefield, Middlesex, which is our main training site for recreational, squad and our elite classes and also at our satellite facility at Rickmansworth Secondary School, Rickmansworth, Hertfordshire, where we hold our recreational and tumbling classes. Our site at Harefield has a full size competitive sprung floor, along with all the equipment you would expect at a comprehensive training venue. We are always looking for enthusiastic and committed gymnasts to join our recreational, squad and elite squad classes. If you are interested in booking a free general gymnastics taster, please click the BOOK A TASTER SESSION link here or on the menu bar above. If your child is an experienced gymnast and you would like to book a free squad trial please click here. For information on our class dates and times please click here or visit the ‘Book a Class’ tab at the top of the page. We look forward to welcoming you to Harefield Gymnastics. Our mission is clear: to coach and train our gymnasts to the highest possible standards, to bring the best out of every child so that they may fulfill their true potential. At Harefield Gymnastics, we recognise that specialist instruction, inner ability and true dedication will achieve the best results. We have a team of highly qualified coaches trained to British Gymnastics standard. Natasha Maxwell as our Director of Coaching overseas all areas of coaching from recreational to our elite gymnasts. Her team of coaches includes a number of former championship gymnasts who provide a wealth of knowledge, expertise and experience backed up with British Gymnastics qualifications. All our coaches hold the appropriate levels of child protection security checks, including DBS and Safeguarding certificates. For more information about our coaches please click here or on the ‘Coaches’ tab under ‘About Us’ at the top of the page. For further information on fees and our cancellation policy please click here or go to our ‘Polices’ page on the ‘About Us’ tab at the top of the page. We believe in the safety and protection of all our gymnasts and we are proud to hold a recognised ‘Clubmark’ accreditation from Sport England, recognising our sound policies and procedures.